The fire service has seen many changes throughout its rich history. It is evident that as time progresses the fire department takes a larger role in more of the specialized emergency services that are available. Progressive fire departments today no longer exist solely for their expertise in fighting fire. Emergency medical services is one of those services that most fire departments offer in some form. Prior to the 1970's, emergency medical services were largely unregulated. If a person was seriously injured or ill, they were usually driven straight to the hospital by a family member or friend. If you called for an ambulance in those days, it usually came from a local funeral home driven by the mortuary attendant. Emergency services have evolved tremendously since then. Today the public expects to receive an ambulance equipped with the latest medical equipment operated by a pair of professional emergency medical providers at their door in a matter of minutes. Television shows like 9-1-1, ER, and Chicago Fire have increased public awareness of emergency services in general. Although these shows are purely fictional, they have given the public a basic idea of the job we do as the emergency responders. Davie County operates a full-time, County-funded department whose purpose is to provide fast emergency medical care when needed. Known as Davie County EMS, this organization has been providing emergency medical services for Davie County residents and sends at least one ambulance with two on-duty responders to any call for a medical emergency. Each ambulance must have at least one certified EMT-Paramedic; the other responder must be certified to a minimum of EMT-Basic. 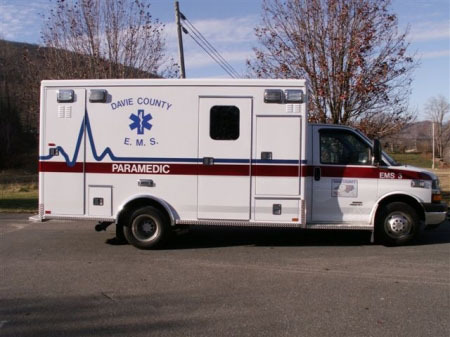 Davie County EMS operates out of several bases throughout the county to provide the best possible coverage. 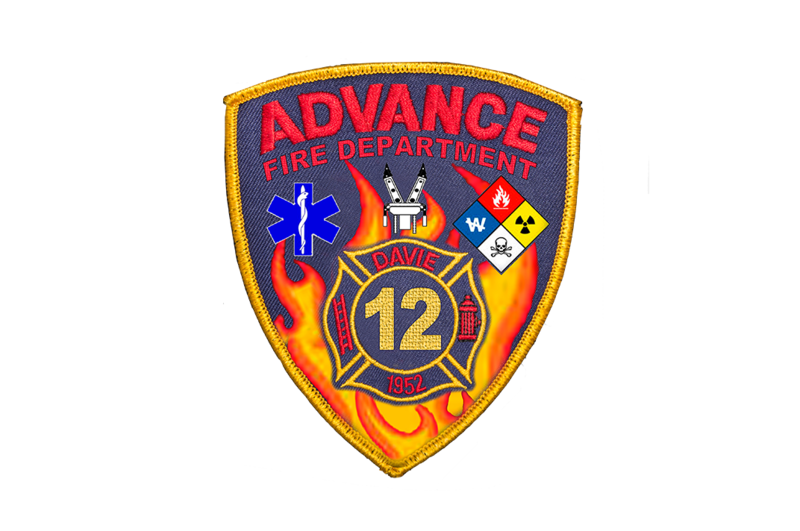 The primary base for the Advance community is the Advance Fire Department Base, located at 1869 NC Highway 801 South, Advance, NC. Davie County EMS along with all Davie County Fire Departments, including Advance Fire Department organized a first responder program to assist our community during medical emergencies. The department purchased a truck and equipped it with vital medical equipment that is designed to provide basic medical care in the field while awaiting the arrival of EMS. A large group of personnel from our department volunteered to be apart of this program, which required them to receive extensive medical training, including how to perform proper CPR, use an AED, check vital signs, administer oxygen, bandage wounds, splint broken bones, treat a shock patient, treat burn victims, and many other life-saving skills. After we completed the training and purchased the proper equipment we began responding with EMS to medical emergencies. Today we have three engines, one squad unit, one ladder truck, a rescue unit & utility unit all equipped with medical response equipment. We currently have 24 first responders, all of which are State-certified EMT-Basic level. We also have 22 TR (technical rescue) Technicians, 6 Hazmat Technicians, and 10 Swift Water Rescue techs. Keep in mind that our first responders do not replace the high-quality, professional service that Davie County EMS provides. We simply supplement their response. And this service is arguably the most valuable service we offer. Emergency medical professionals are taught that time means everything in a serious medical emergency. If your loved one is suffering from a heart attack or stroke, our medical responders can be there in a matter of minutes, starting emergency care much earlier. If someone begins to choke or even needs CPR, our medical responders are right around the corner. No one can predict the outcome of a medical emergency. But statistics show that a patient has a much better survival rate if prompt medical attention is received. This service is just another example of our dedication to serving you.